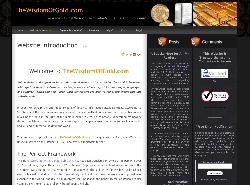 MEDIA ADVISORY, Jan. 2, 2011 /Christian Newswire/ -- In the wake of the continuing global economic meltdown, and decline of the so-called "prosperity gospel," two new Christian websites have been launched to provide biblical answers: EconomicTheology.com and TheWisdomOfGold.com. Founded upon the Scriptures, and supported with abundant archeology and superior monetary science, these websites are being praised by Christian leaders for their sound biblical teaching. Award-winning Christian author, Rev. Rich Vermillion, is becoming widely known as the "Economic Theologian" because of his recent work in these subjects. The combination of his two decades of ministry experience, and his autodidactic studies of economics and monetary history, have equipped Rich to uniquely communicate biblical financial truths. The ongoing economic collapse also makes his efforts timely. "The current economic troubles have actually served to be a blessing in disguise," Rich explains. "During the 'boom years' of the U.S. and global economies, the false-ministry 'wolves' were able to spread their half-truth 'prosperity' teaching easily. But when the inevitable economic 'bust' came, because of terrible government fiscal policies and fraudulent banking practices, the wakeup call came for many people. Professing Christians are now doing the simple math and figuring out that they have never earned 'one hundred-fold' returns on their giving to these self-serving religious con artists. In fact, many are now realizing that they are actually worse off financially. Their 'suicide offerings' only enriched the lavish lifestyles of those to whom they gave. So they are discovering that Proverbs 22:16 is really true, and many people are now turning away from these wolves en masse." The so-called "prosperity preachers" are not the only ones that have him concerned, however. "Dave Ramsey has me very concerned too. While I applaud his past efforts to encourage Christians to get free from debt, his current anti-gold rhetoric defies both the Bible's precepts and all monetary history. What is particularly troubling is his apparent financial interest in 'Gold Stash for Cash' (GSFC, LLC), which buys the very things that he tells everyone to get rid of. The similarity to Proverbs 20:14 is striking. One cannot help but notice a clear 'appearance of evil' here, though his ignorant advice is the most dangerous." Rich adds, "We are stepping into the vacuum left behind by the miscreants in order to give people the WHOLE truth on these subjects. Best of all, we are giving it to the Christian public for FREE."